Enjoy these perfect little potato bombs, which are packed full of flavour and great party nibbles for all the family to share. 1Using an apple corer force a hole all the way through each potato lengthways. 2Keep the cored section of potato and cut a 1cm piece from each end to use as a plug. 3Fill the hole of each potato with filling of choice then plug up the ends. 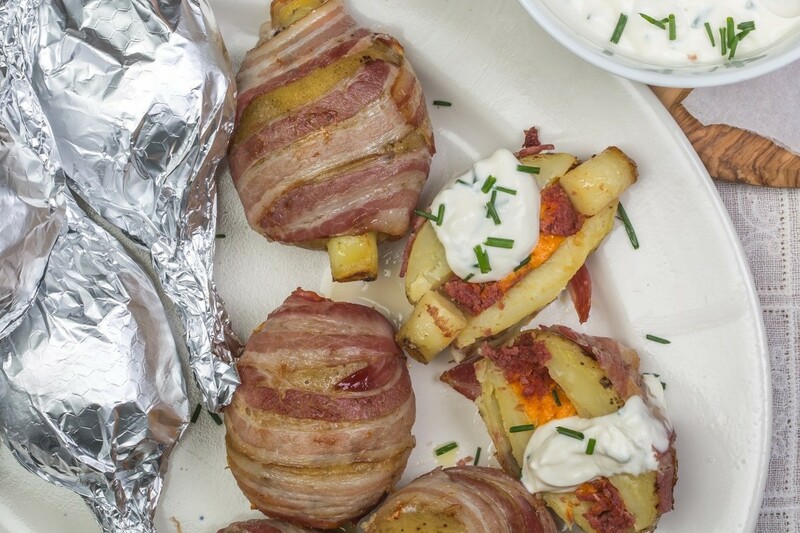 4Wrap each potato in 2 slices of streaky bacon, rub over olive oil and wrap tightly in foil. 5Either cook on BBQ or oven at 180°C for 1 hour - 1 hour 20 until soft. 6Once cooked unwrap from foil, cut in half and serve with a dollop of crème fraiche and chopped chives.